1 Comment on Dinner time! Back to the kitchen! I wanted to make something different for dinner. We get hooked on the same things over and over again, and I wanted something different. So I consulted Pinterest, and found nothing! That’s when I decided to check with my Betty Crocker Red Book! Sorry Amber but I’m going it alone again! I found a recipe for beef stroganoff. 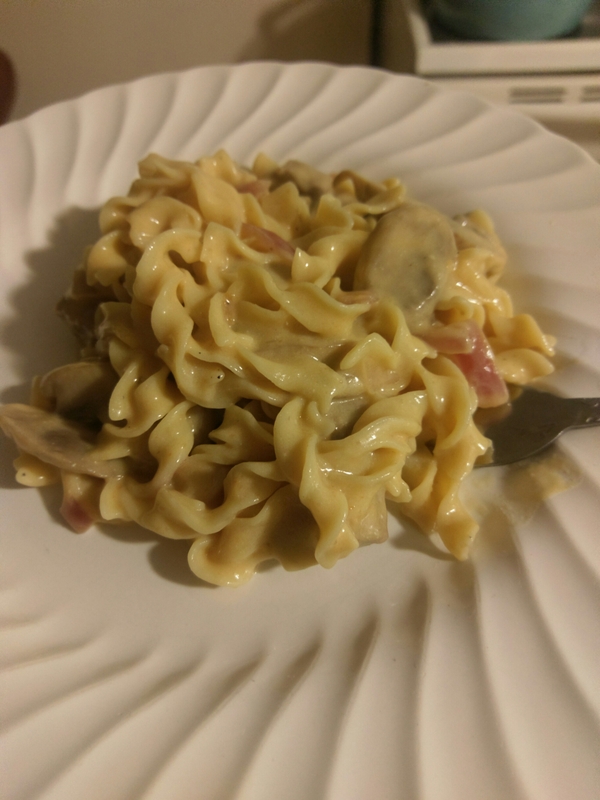 I used to love beef stroganoff when I was growing up, and hadn’t had it in a long time so why not! Beef Stroganoff first premiered in Russian, Elaina Molokhovet’s, cookbook “A gift to young housewives” in 1871 as beef a la stroganov with mustard. Oddly the original recipe did not call for any mushrooms or onions as it is presently well known for! Another version from 1909 calls for crispy potato straws (French fries) as a side dish which is considered the traditional side for this dish in Russia. As the dish spread to China before WWII it was popularly served in hotels and restaurants with variations like sides of rice or pasta instead of potatoes. Even today there are many different versions some served with a tomato based sauce others with the sour cream served as a condiment on the side. In the US it is more common to see the sour cream mixed in the sauce and added to the dish at the last minute before serving, which is true of Betty Crocker’s version. Here is the link to Betty’s recipe! I thought it was good, much like what I had growing up. The sauce is tangy and creamy, the meat was tender. My husband said it’s OK for beef stroganoff. My daughter however is not a fan. She said it smells so good…but it’s so not good… Lol! Can’t win ’em all I guess! Enjoy!